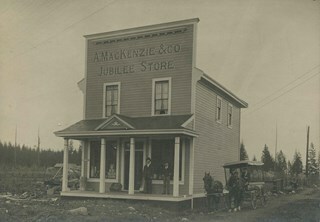 "A. MacKenzie and Company Jubilee Store"
Photograph of the A. Matheson & Sons store building located at 3576 Kingsway (later renumbered 4920 Kingsway) and Nelson Avenue. Signs on the store read, "A. Matheson & Sons Market / Fresh Meats - Groceries / Quality and Service / Dexter 1372, 1373 / Free Delivery." Additional signs and billboards include "Burnaby Liberal Committee Rooms" and a cigarette billboard. This store was previously owned and operated by Alexander MacKenzie. 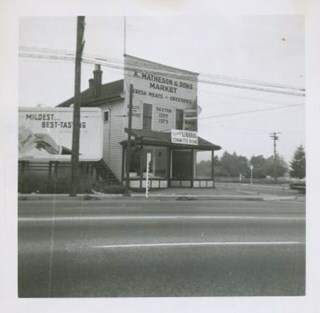 Photograph of the exterior of A. Matheson and Sons Market at 3576 Kingsway (later renumbered 4920 Kingsway) and Nelson Avenue. Signs on the building read, "A. Matheson & Sons Market," "Fresh Meats - Groceries," "Quality and Service," "Dexter 1372 1373," and "Free Delivery." Signs advertising prices are outside the store. A sign by the street lights reads, "Signals set for 29 mph." Cars can be seen. This store was previously owned and operated by Alexander MacKenzie. 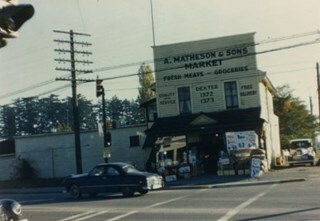 Photograph of the exterior of A. Matheson and Sons Market at 3576 Kingsway (later renumbered 4920 Kingsway) and Nelson Avenue. Signs on the building read, "A. Matheson & Sons Market," "Fresh Meats - Groceries," "Quality and Service," "Dexter 1372 1373," and "Free Delivery." Signs advertising prices are outside the store. A sign by the street lights reads, "Signals set for 29 mph." 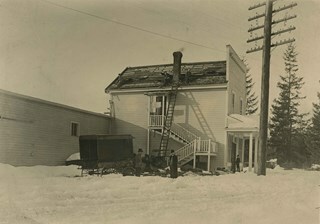 This store was previously owned and operated by Alexander MacKenzie. 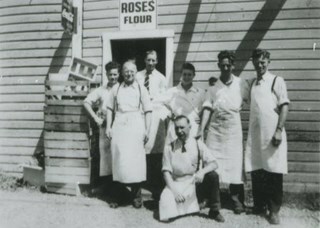 Photograph of a group of employees in front of Matheson & Sons Market at 3576 Kingsway and Nelson Avenue (later renumbered 4920 Kingsway). Left to right: Barry Burns, Angus Matheson, Dan Matheson, Ed Matheson, Lex Henderson, John Matheson, and Gil Summers (kneeling). There are Coca Cola and Roses Flour signs over the door. This store was previously owned and operated by Alexander MacKenzie.